Personally, I’m going to blame Riley Sager for the bar he’s set with me when it comes to thriller writing. If you’re not giving me Sager-style twists at this point, five stars are going to be out of reach. But truthfully, I save my five-star ratings for books I want to turn into liquid form and inject directly into my veins on an IV drip. So, with perspective, 4 stars is a really good rating for me. In Tear Me Apart, there are a lot of moving parts and some of it requires a gleeful suspension of disbelief that doesn’t come exactly easily to me, because even in the world of make-believe, I’m still looking for the basics to make a kind of logical sense. I want things to be thought through. Even if we’re talking about dragons and wizards. It was a little bit too much in terms of the domino effect and convenience of revelation. I suppose I like my plot lines to have a bit more intention, and a little less coincidence. But, if you can let that part go, then you’re in a for a ride. There are a lot of heavy themes that are dealt with through the course of the story – cancer, relationships, child abduction, the aftermath of tragedy, depression and suicide and a mother’s love. Ellison tackles all of these themes head-on. She never shies away from trying to put the most human and honest lens onto the situation and the characters, even if that means revealing flaws that don’t have a good excuse. Yes, I ate all the Halloween candy already. I don’t know what you want me to say!? I can’t control myself! Don’t let me buy Halloween candy so early. Christ! This dedication to honesty and character development makes this a more lengthy read, but well worth it for the emotional experience, and the connection you develop to the characters, even the more sinister ones. There’s also some flashback, psych ward scenes that lend to backstory and mental health history which were maybe some of my favourite scenes. Because you know, if there’s anything I love more than eating all the Halloween candy three weeks before Halloween, it’s a psych ward setting. This novel is like an onion, each layer revealing new lies that have been festering and covered up, more secrets about the character’s pasts and motivations – mostly everything said and done in an effort to protect the child at the centre of it all, Mindy Wright. The golden child. The skiing prodigy. It would have been really easy to write Mindy as being super annoying, too good and too perfect and too talented, but Ellison managed to create a humble and genuine sun for the rest of the characters to rotate around. Even in her excellence. Even in her darkest moments. I was also left hanging a little bit on the storyline of Dr. Castillo. She clearly had nothing to do with the events 18 years ago, so how did anyone even know to mention her, to weave that story, to tell that lie? That any of her crimes lined-up in terms of dates and locations… oh it’s just a bigggggg coincidence? Just the perfect excuse plopping into someone’s lap? Please. But that’s just one issue I had with an otherwise deeply developed novel that can hold your interest for a full 500 pages with rich characters and dramatic layers. The pacing is slower than that of Lie to Me, but the investment you develop in the story, into the lives of the Wrights, is a call back to Lie to Me, where the reader was hooked on the outcome, connected to the characters and their fates. This is a thriller, but it’s also a family saga, one that plays up the sinister tones of the lengths a mother will go to protect her child, to have a child, to make sure a child is safe when you don’t feel you can be the one to provide that safety. 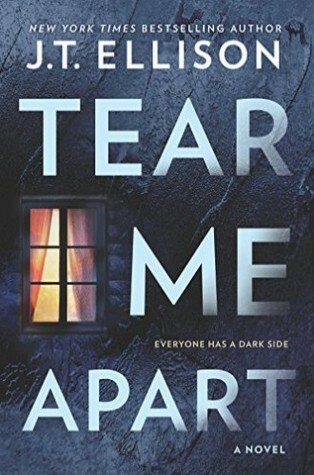 Though it relies a bit too heavily on coincidence and is slightly predictable, with a few loose ends, Tear Me Apart is a book deserving of your time. Posted on October 9, 2018 January 24, 2019 by Krystin RachelPosted in 4 Stars, Reviews, Surname: A to LTagged book, Book Blog, Book Blogger, Book Review, book reviews, bookblog, bookblogger, bookreview, bookreviews, Books, Bookstagram, Crime Fiction, currently reading, Goodreads, instagram, jt ellison, Mystery, Mystery Fiction, mysteryfiction, Read, suspense, TBR, tear me apart, Thriller. I love your reviews so much, they’re more entertaining than some books. Forced coincidences annoy the hell out of me, because this is actually a book not real life, and we know that any and all coincidences happened because the author wanted them to, so it isn’t all that exciting to read. This sounds fun, though, improbable coincidences aside. And that’s exactly why I hate coincidences in stories as well! You can create anything, come up with any plot device or circumstance and you choose for things to fall into people’s laps. It’s almost, dare I say, lazy writing? That aside, the characters in this novel really pull you in and make you feel a connection to them, so I wasn’t as annoyed as I usually would be. Thank you, doll!!! We will have to gush about Sager sometime because I love his writing SO MUCH. Great review! I am also a picky/critical reader and find myself giving 4 stars out most frequently (even books that I adored). Good to know I am not the only one that’s hard to please.